The Country Gentleman was an American agricultural magazine founded in 1831 in Rochester, NY by Luther Tucker. 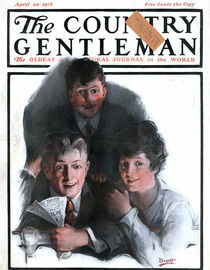 The magazine was purchased by Curtis Publishing Company in 1911. Curtis redirected the magazine to address the business side of farming, which was largely ignored by the agricultural magazines of the time. In 1955, Country Gentleman was the second most popular agricultural magazine in the US, with a circulation of 2,870,380. That year it was purchased by, and merged into, The Farm Journal, an agricultural magazine with a slightly larger circulation.